The powerful way to use biofeedback at home! 1. Increased heart rate. This pumps blood around the body to get oxygen and sugars to the cells that you will need to use to survive. Symptoms that can be associated with this stress response might include: Rapid or irregular heartbeats. 2. Breathing usually becomes more rapid. This is to get more oxygen into the body. Symptoms that can be associated with this stress response might include: hyperventilation and some forms of asthma. 3. Stress hormones are released. Adrenaline, also called epinephrine, is released by the adrenal glands. This hormone helps to maintain increased heart rates and will tell the liver to release stored sugar for energy to the body. Other stress hormones do other thing. Noradrenalin is associated with anger and will raise blood pressure for most people. Symptoms that can be associated with this stress response might include: high blood pressure, panic or anxiety. 4. Blood pressure can go up. Triggered by released stress hormones. Symptoms that can be associated with this stress response might include: high blood pressure. 5. Changes in blood flow/circulation. Blood is directed toward the brain and major muscles for survival. Blood is directed away from surface of skin in hands and feet (for survival a primitive response so you do not bleed to death if you get cut running away or fighting for your life0. Blood is directed away from digestive organ and reproductive organ because for survival it becomes a low priority to digest food or keep the species alive if you are threatened. Symptoms that can be associated with this stress response might include: high blood pressure, cold hands and feet, upset stomach, migraine headaches, pre-ulcerous/ulcerous conditions, increased colitis, sometimes constipation, and 70% of sexual dysfunction in both men and women can be linked to this stress response. It is this stress response that Temperature Training Biofeedback is designed to control. By practicing: breathing techniques, Autogenic Training, guided relaxations, visualizations, meditations, self-hypnosis, etc. you can learn to let go of stress and then raise your hand temperature. Ideally, you would like to be able to warm your hands to 93-95+ degrees. This can take some time and practice, often 8-12 weeks. Usually, if you are practicing 1-3 times per day, you will find increases in hand temperatures within 4-6 weeks, occasionally sooner. In fact, many people find their hand temperature dropping in the first few weeks. If this is happening, you may be trying too hard to relax! This is not bad. It means you have good control, but just not in the right direction. This can take time and practice. You want to try temperature training in a warmer room, in the beginning. Or you may want to warm your hands by placing them in warm water (remove thermometer first,) holding them up to source of heat, or even in the sun light. This mechanical warming can assist you in learning to let go of constricted blood flow and so to be able to warm your hands mentally. After mastering raising the hand temperature, consistently, to 93-95 degrees, you will want to learn to warm your feet to 90 degrees. This is usually more challenging, but will usually be the key to lowering blood pressure, controlling panic/anxiety, preventing migraines, etc. 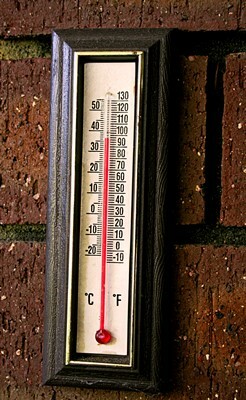 The key will be to tape the thermometer to the ball of your foot, at the base of one of your big toes. By practicing the relaxations and learning to let go of stress, you can get your temperature to move up to about 90 degrees. When you have mastered this and can get your feet to consistently warm to this level, you will see reduction of stress related symptoms. Warming the lower extremities, though difficult, is very important to developing this process of control. Using these skills regularly will aid in prevention of the stress related symptoms. Like learning to ride a bicycle, you will never forget how to use this new skill. You may get rusty and need practice, but your body will have a new, healthy skill, forever! Remember everyone holds their tension in one or more system. You need to identify which systems respond when you get stressed and then learn to release this physical tension. It takes time and motivated practice to learn to let go but the results in enhanced quality of life and increased productivity are worth the effort.